Do you know what a Prosthodontist is? If you don’t know you are not alone. Prosthodontists say they are asked that question almost every day. A simple description might be ” a Port Orange dentist on steroids” or, as the University of Michigan’s Dental School puts it, “Prosthodontists are the quarterbacks of dental treatment plans.” One of nine specialties recognized by the American Dental Associtation, prosthodontists are pretty much the top of the dental food chain. Becoming a prosthodontist not only requires a traditional four-year dental degree but also an intense three additional years of postgraduate work. That may explain, at least in part, why the ADA says there are approximately 170,000 general dentists in this country but only 3,200 prosthodontists. They treat complex problems including dental implants, custom made complete and removable partials and dentures, replacing lost teeth, dealing with the special needs of geriatric patients, treating children born with cleft palates or missing teeth, custom-building prosthetics as well as dealing with sleep disorders such as apnea and excessive snoring. Dr. Bowers is a prosthodontist. She obtained her Doctorate from the University of Florida which included an One-year Residency in Advanced Education in General Dentistry (AEGD). The challenging cases Dr. Bowers was exposed to that year started her passion for implant dentistry and intraoral surgery and led to several more years of schooling. She attended a 36-month course and obtained her Masters Degree and Specialty in Prosthodontics and Implant Dentistry. 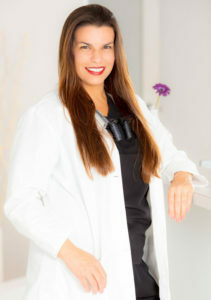 After that she attended school as a full-time resident at University of Florida – Periodontology specialty and master program, dedicating thousands of hours to the care of advanced periodontal disease cases, periodontal surgery, transplantation of tissues of the mouth and fine tuning her knowledge in dental implantology. Dr. Bowers truly enjoys treating her patients and is known for her friendly and welcoming demeanor. As a Port Orange dentist, compassion is one of her best attributes. When she is away from the office, she is 100% mom for her little boys. In her free time she enjoys spending time with her family, reading, fishing, spending time on the beach, exercising and being outdoors.